How does one man change the world? It's a question that haunts Bruce Wayne like the specter of his parents, gunned down before his eyes in the streets of Gotham on a night that changed his life forever. 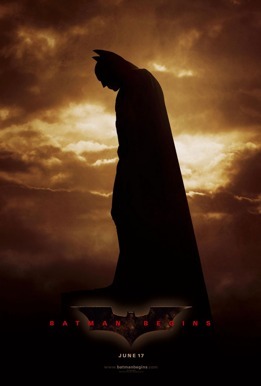 Tormented by guilt and anger, battling the demons that feed his desire for revenge and his need to honor his parents' altruistic legacy, the disillusioned industrial heir vanished from Gotham and secretly travels the world, seeking the means to fight injustice and turn fear against those who prey on the fearful. In his quest to elucidate himself in the ways of the criminal mind, Bruce is mentored by a mysterious man called Ducard in the mastery of the physical and mental disciplines that will empower him to fight the evil he has vowed to destroy. He soon finds himself the target of recruiting efforts by the League of Shadows, a powerful, subversive vigilante group headed by enigmatic leader Ra's al Ghul. Bruce returns to Gotham to find the city devoured by rampant crime and corruption. Wayne Enterprises, his family's former bastion of philanthropic business ideals, now rests in the hands of CEO Richard Earle, a man more concerned with taking the company public than serving the public good. Meanwhile, Bruce's close childhood friend Rachel Dawes, now an Assistant District Attorney, can't secure a conviction of the city's most notorious criminals because the justice system has been so deeply polluted by scum like crime boss Carmine Falcone. It doesn't help that prominent Gotham psychiatrist Dr. Jonathan Crane bolsters insanity defenses for Falcone's thugs in exchange for nefarious favors that serve his own devious agenda. With the help of his trusted butler Alfred, detective Jim Gordon--one of the few good cops on the Gotham police force--and Lucius Fox, his ally at the Wayne Enterprises' Applied Sciences division, Bruce Wayne unleashes his awe-inspiring alter-ego: Batman, a masked crusader who uses strength, intellect and an array of high tech weaponry to fight the sinister forces that threaten to destroy the city.